It's Wednesday, which means Media Create Japanese chart results, and this week brings further cheer for everyone's favourite pink ball, as Kirby: Triple Deluxe retains top spot in the software chart. The hardware positions remain the same, but with every system seeing a drop in sales. To start with the software top 20, Kirby follows up his impressive launch sales with more solid numbers, while a remainder of established games eke out more sales to add to their totals. 3DS titles are dominant once again, with Puzzle and Dragons Z and Pokémon X & Y still picking up the runners-up honours. Super Mario 3D World is the Wii U's sole entry in 10th position; the results (physical retail only) are below, with lifetime sales in parenthesis. Perhaps unsurprisingly, considering the dearth of new releases, hardware numbers dropped across the board. The 3DS remains on top, both with the XL / LL individually and with both models combined, while the Wii U remains behind the PS3; last week's results are in parenthesis. It's been a strong opening fortnight for Triple Deluxe in comparison to some previous titles starring the mascot, and Nintendo will no doubt hope for a positive reaction when it is eventually localised for the West; as for hardware, Nintendo will naturally want to bring the Wii U back up to its stronger Holiday levels — at which time it was second behind the 3DS XL — in the coming months. Good to see the Wii U did decent, kind of strange how PS3's are still selling as well as they are when the PS4 is just around the corner in Japan. So Kirby is selling like 3D World in total sales? I'd have thought it would do better faster honestly. Dear Monster Hunter 4......let us help you to get over 5 million in sales Please!?!? @64supermario The PS3 has built a large game selection over time despite its poor launch, and it's currently selling the much smaller and lighter "super slim" model that was released a couple of years ago. If you take out Wii backwards compatibility from Wii U, the PS3 is otherwise a better deal right now than Wii U. The bright spot in this.....January which is typically a horrible month for hardware sales, sees the Wii U still above 10K and not treading in the 2-3K like before......but we need some hype before DKTF in a month. A release date filled Nintendo Direct would be nice. Can't wait to get this in NA! At least in a month like this the sales are quote unquote supposed to be horrible. US Kirby in the next ND please. And a date for MK8. There are so many Wii U games due out yhis year, a date filled ND could really help the Wii Us outlook. @64supermario PS3 has tons of rpgs and Japanese action games in development, much like the ps2 did years after ps3 hit. If you aren't a 3DS in Japan, you are DOOOOOOOMED! Some days ,wish the handheld market was a bit more loved here in America. ANd I'm with @Spoony_Tech, where is our Monster Hunter 4 for NA! January's almost over, and it's been over a month since the last Nintendo Direct. We usually get at least one Direct--even a small, game-specific Direct--per month. Come on, Nintendo, show people more reasons to buy your systems! I want this game so much! 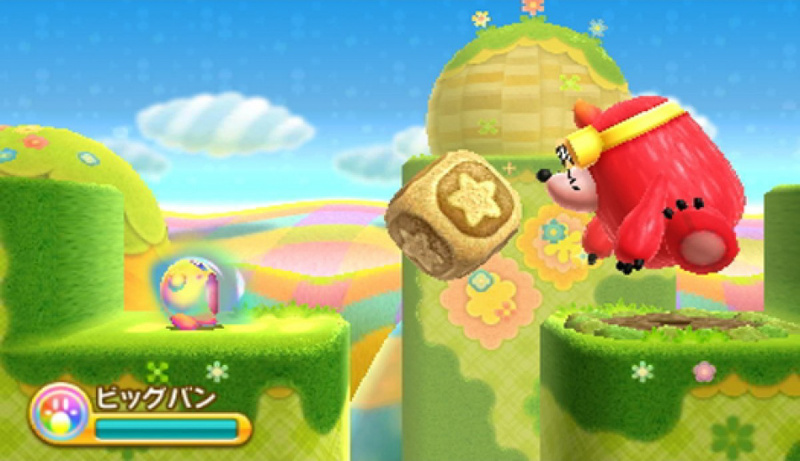 It looks to be similar in gameplay style to Kirby and the Crystal Shards, which my favorite Kirby game of all time. @Spoony_Tech Im with you. MH4 please. @64supermario Japan seems more sensible in that they don't buy a console until it has enough games they want (Or one they want lots). Ouch. This month is pretty brutal though it makes it even more impressive that Triple Deluxe is doing so strong right out the gate. Hopefully this Kirby success can accelerate the locallization of the game in America and Europe ASAP! It's my most anticipated 3DS title right now! Maybe the delay on NoA/NoE is because they are working very hard on make Kirby angrier than the Japanese cover of the game haha. @KnightRider666 Is there a release date yet? @Mahe The Super Slim is worse than the Slim when it comes to build quality. They have also removed progressively more and more as time has gone on. (Used to have a full PS2 in there / OtherOS). @unrandomsam how so? Sure the slide door thing is a bit rubbish but otherwise I'm very happy with my super slim. It's not encouraging that the PS3 is outselling the Wii U. When customers prefer a 7 year old console over your new one, it's a bad sign. And while the console is finally selling more units, it's still a negative. I just don't see why a kid with limited funds would buy one...weak online, no sports games, and weak supply of 3rd party hits. Mario can only go so far...and I'm speaking of the whole world. I know many who would love to play Nintendo games, but cannot afford to drop $300, on what is fast becoming a Nintendo exclusive console, as they also need to drop $400 on another console if they want to experience big hits outside of Nintendo. It's simply viewed as a poor value, despite the love for Nintendo....$ buys products, not found memories of gaming as a kid. The entire Nintendo team needs to be fired. They are lucky not to be in the US. A 60% miss in sales goals screams of corporate incompetence and/or willful lying. They have taken their investors for a ride. I'm a long, long time Nintendo fan, but there is no more defending their pompous attitudes. That's because it's clearly an all-round very high quality game. 100% true. Its a POS...every hardware review confirms it. The original slim was the way to go. It's basically almost impossible for this game to not have at least decent sales. And as a Kirby game, there is little story and almost no text to translate. No release date outside of Japan. Am I the only one surprised by the resilience of Youkai Watch? When Smash Bros. releases, they need to release a bundle with a Wii U, 3DS and both copies of the game. Here in the UK, that would be around the same price as the XBox One. People going to buy a 3DS will see this bundle and think "Huh, you get two consoles here and I could continue playing this game wherever I go all for the same price as this VCR here"
@linktothepichu: I think I remember it being in spring of this year. Am I the only one who is stunned by the fact that New Super Mario Bros. 2 is suddenly back on the top twenty list? Classic Kirby is a game that will always triumph because its design is timeless. Then there's Animal Crossing New Leaf, which is still in the top 20 more than a year later. damn i want that kirby game now it looks amazing. @DarkCoolEdge I'd really like to see Youkai Watch come to the States. This sounds like another really cool game from Level 5. I want the watch, also! Hopefully that Kirby game will make its way out of Japan soon. I really want that game. Still glad to see GTA5 still on that list too. Some big RPJ are coming out for the PS3 that won't be on the PS4. If you didn'f own a Sony system till now the PS3 is awy better deal than the PS4. Way more games, free online and cheap gamex to boot. As long as no one is buying that basically useless piece of garbage 12gb model without knowing they will need a new harddrive. Still waiting for Kirby's release date for Europe. Hopefully the rumours would be true and tomorrow would be a special Nintendo direct. It could be a perfect place to announce some release dates. Wonder why Nintendo does poorly in America maybe just maybe if we could get just some of the titles Japan gets and didn't have to wait for two to three years after - come on Nintendo where is Monster Hunter 4 and now Kirby ? If they would release MH4 here with online it would fly off the shelfs .